The number one reason people start worm farming is because they want to turn fruit and vegetable scraps into an enriched potting soil. Great soil that can be used for their garden and house plants. Worm composting is like a natural wonder-drug for your plants and garden. It is a project that can be easily done year round by home owners and apartment occupants. 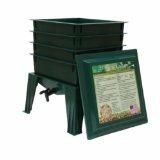 It’s ideal for people who have limited space to set-up a compost bin but want to compost their food scraps. This is an activity that is not only good for yourself but for the environment. Everyone can worm farm! To start worm farming you will need a strong plastic container about 7″ deep. I usually use one about 9-10″ wide and 14-16″ in length. 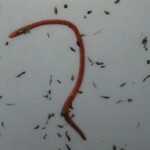 The worms most suitable for worm farms are red worms (also known as red wrigglers or manure worms), blue worms and tiger worms. 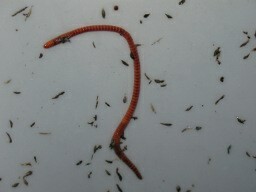 Nightcrawlers and earthworms should not be used. Place the containers in dark or well-shaded areas. Container, crates or bins can easily be stacked to take up less room. In the plastic container you need to add shredded newspaper (not colored paper) dampened, but not soaked. Add a few handfuls of garden soil and a few crushed eggs shells to the newspaper. Keep the bedding material wettish but not drenched. Worms need the moisture for breathing through their skin. 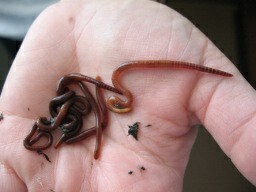 If the worm farm is left outside make sure that there is proper drainage in the container. The proper amount of water and temperature is critical to having a healthy worm farm. Eliminate placing the worm farm in direct sunlight and in colder weather bring it into a shed or garage to keep it from freezing. 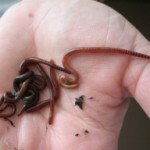 Don’t allow your worm farm to dry out because without water they will die. Temperatures between 50 to 80 degrees Fahrenheit is good for worm farming. Be aware that any temperature over 90 degrees will cook your worm farm. It is imperative that you know what to feed worms when worm farming. Worms will eat anything, good or bad, so you need to determine what may or may not be appropriate. Fruits, vegetables and starchy scraps (bread, pasta, oatmeal) are very nutritious. Worms prefer the scraps chopped and smaller so they are quicker and easier to digest Some nonfood articles like leaves, hair clippings, cotton rags, paper products and soaked cardboard may be given to worms. Refrain from feeding worms oily substances. And don’t feed them too many acidic foods, coffee grounds or tea bags. Never feed worms dairy products, meat, poultry or salty foods. These items should be eliminated because they create a rotting smell that draws unwanted pests to the container. Foods that have been treated with chemicals and medications should not be offered to worms. Worms in your worm farm will try to leave the container if you feed them onions, garlic or shallots. When deciding how much food to feed worms remember that worms consume half their body weight each day. So feed them appropriately. New food should be fed only when the other food is almost gone. Never overfeed worms because it can lead to problems with unwanted odors and pests. When introducing new worms to your worm farm feed them smaller amounts of food. As they get settled the amount can be increased. Something that you must be aware of is that the worm population doubles every few months so be careful not to underfeed them. The benefits of worm farming is that worms use leftover scraps and change them into castings or vermicast. Worm castings and vermicast are a rich soil-like substance that is great for feeding house plants, adding to seedling mixes and potting soil. Many people use it as a top-dressing around plants. Castings can be saved in containers with lids to be used at a later date. Worms reduce the amount of garbage that would otherwise go into landfills. About one-third of household waste can be recycled by worm farms. A properly fed worm population can live for 5 or more years. You and the environment will benefit from worm farming. A worm farm is easy to set-up. Anyone can worm farm!